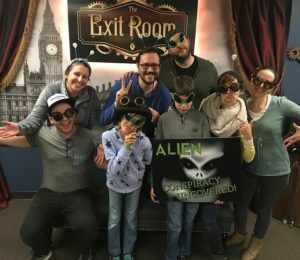 If you follow the Exit Room on Facebook or Instagram, you’ve probably noticed a difference in the group pictures we’ve been posting lately. If you don’t follow us on social media… Why aren’t you following us? Go fix that right now – go to Facebook or Instagram (or both), and click the “follow” button. I’ll wait. Ok, now that that’s taken care of, back to what we were talking about. True to the Escape Room industry, we’ve always posted pictures of groups after they’ve escaped a room. 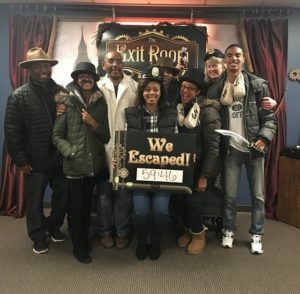 The people in the group always look excited, they usually choose some sort of prop for the photo, and they always hold a sign with the words “We Escaped!” and the time they escaped in written on it. These days, the groups still look excited and a majority of them choose to pose with some sort of prop, but the sign has changed. 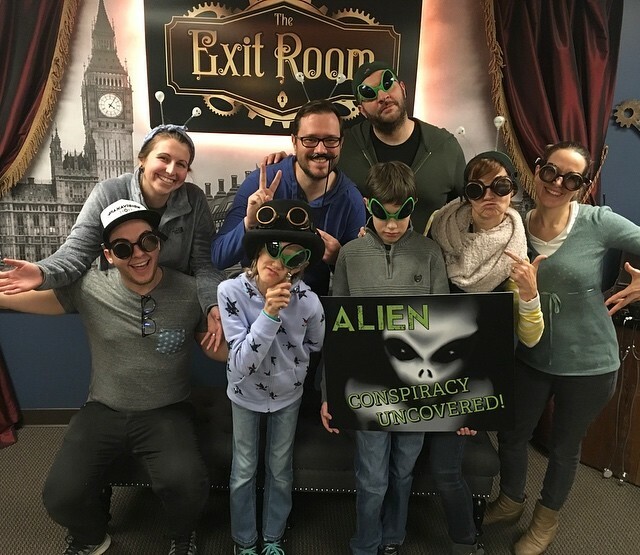 Instead of the usual “We Escaped!” sign with the escape time written on it, our groups now hold a sign specific to the room they adventured in with a simple message like “Alien Conspiracy Uncovered” or “Treasure Found”. If an escape time is mentioned at all, it’s in the post accompanying the picture. I know what you’re thinking: “So what? That’s not such a big deal.” But actually, it is. 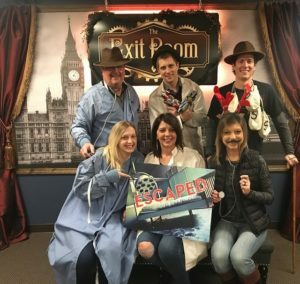 You see, at The Exit Room, our whole escape room philosophy is different than the industry standard. Our goal isn’t to make it as hard as possible and sit back while you try to “break out” in a certain amount of time. In fact, while Escape Rooms are favorite challenges for gamers, we don’t cater to gamers. They are actually only a small niche of our customers. 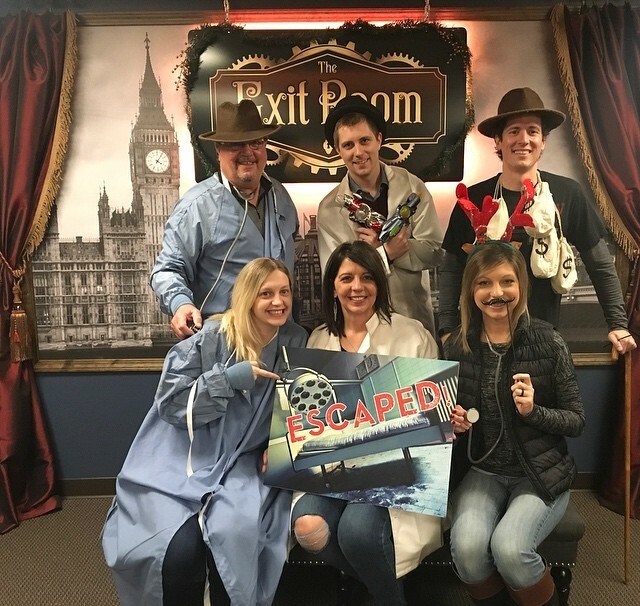 At The Exit Room, our goal is to give you an immersive adventure – to make you feel like you’re really there – with just the right amount of help so that escaping is neither frustrating nor boring. We want you to enjoy the experience and have fun – not just power through and conquer. When you adventure at The Exit Room, you will have your own dedicated Game Master. He or she won’t be monitoring several rooms at once; they are focused on your adventure and making sure you’re having a great time. We train our staff to really monitor what’s going on. They listen to what’s being said, watch players’ body languages, and follow the group’s progress. By doing all of this, they know when to jump in and prompt you on to the next step before you get frustrated. We’re not stingy with clues, but neither are we frivolous. Our goal is to guide you out in the nick of time, making your adventure suspenseful (and a lot of fun). We’ve had others in the industry look at our escape rates and deduce (incorrectly) that our adventures are easy because everyone breaks out. But this couldn’t be further from the truth. Our adventures are well thought out and designed to be clear, but they are still very challenging. The difference is, we’re on your side. We actually want you to break out. There’s nothing more unsatisfying than paying for an adventure that you don’t see the end of. Our adventures are created so that with the proper amount of assistance, everyone will see 100% of their adventure. So what are you waiting for? Book your adventure today and see how our philosophy works for yourself.